It'll probably be a few more years before 3-D printing begins revolutionizing the world of retail, but it's already making a sizable splash in today's DIY community. For around 1500 bucks, it's now possible to get your hands on a consumer-grade 3-D printer that's capable of churning out some pretty cool objects. So what kind of stuff can you make? Wired Design's Joseph Flaherty takes us through 10 projects that demonstrate the capabilities of a typical hobbyist 3-D printer. All you have to do is visit Thingiverse (on online repository for 3-D printing templates) and download the CAD files for each model. After that, all you need is a 3-D printer. Most 3-D printer operators advise that your first project should be a cube to test machine calibration. If you're impatient and want to jump right into printing more complex objects, start with plastic Lincoln Logs. You'll know you're printing with consistency if your fort snaps together with ease. Who says geeks can't be stylish? Print this bracelet for three reasons. First, it tests that your machine is well-tuned and can print objects with thin walls. Second, it's amazing to see rigid plastic stretch before your eyes. Finally, it makes a great last-minute gift. Bonus: If bracelets aren't your bag, Thingiverse super user Emmett has turned the bracelet into a tank tread for robots. You can glue and screw 3-D printed parts, but it's not the most elegant solution. Savvy designers will find a way to engineer parts so they can connect them more artfully with joints. For example, this DNA play set helps students understand and model connections in DNA. The printed parts have clever joints that leverage the plastic's intrinsic properties. Things you print don't have to be final products — think in terms of parts. The most interesting projects often combine plastic parts with other materials. This ingenious birdhouse, for example, attaches a printed front end to a coffee can. Hobbyist 3-D printers can't produce moving parts (yet), but printed components can be assembled to create a functional object. This facsimile of a V8 engine demonstrates how various parts of an engine operate, and shows a way to overcome the limitations of a more basic printer. 5. Space Shuttle This shuttle replica is another giant step for mankind. Want to know how modern 3-D printers compare to existing production processes like injection molding? Try comparing this print to store-bought equivalents. One serious drawback of hobbyist 3-D printers like the MakerBot, RepRap, and Ultimaker is that they're monochromatic. Crafty designers have hacked the machines to print multiple colors by splicing colored plastic filaments. The creators of this apple calculated the quantity of color that would be required for each slice of the rainbow, cut the filament to length, and designed a 3-D logo that Steve Jobs would be proud of might not sneer at. Desktop manufacturing is still in the paleolithic era, so adjust your expectations accordingly. As with any emerging technology, low-cost 3-D printers still have many constraints, like single-color printing, low resolution, and small part sizes. That said, for a good designer, "constraint" is just another word for "challenge." MakerBot operator Skimbal obliterated one challenge with his Pièce de résistance. 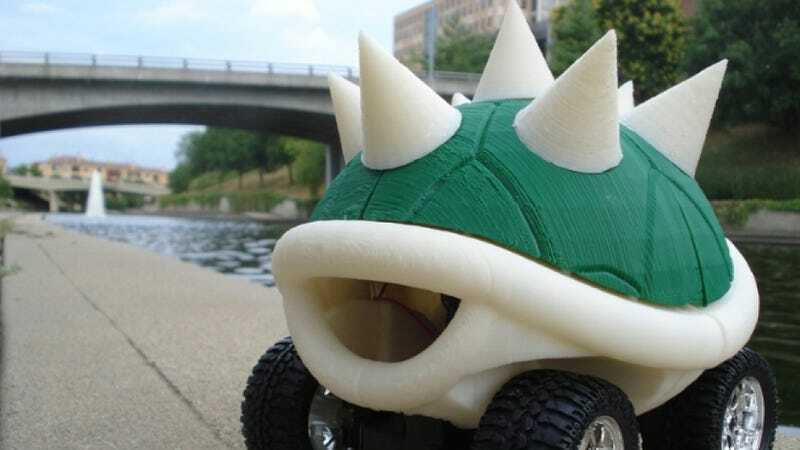 His goal was to build a full-size RC vehicle based on Mario Kart Koopa shells. The Makerbot's constraints would have stymied a lesser designer, but by breaking the design into small parts, Skimbal created a large, multi-color object, where the resolution is barely noticeable. The project takes over 40 hours to complete, but it's like being able to print the Mona Lisa in your garage. This post by Joseph Flaherty originally appeared over on Wired Design, Wired Magazine's awesome new Design blog. Flaherty writes about design, DIY, and the intersection of physical and digital products.